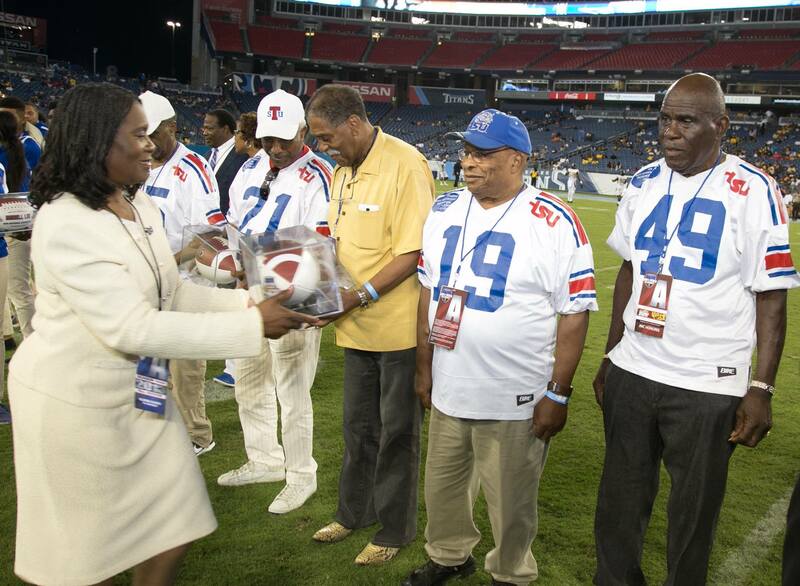 NASHVILLE, Tenn. (TSU News Service) — The 1956 Tennessee State football team, one of the best in program history, was honored at the 18th annual John Merritt Classic on Sept. 3. It marked the 60th anniversary celebration for the undefeated team. Under the direction of second-year Head Coach Howard Gentry, the 1956 squad racked up a number of impressive victories en route to a perfect 10-0 record and a Black College National Championship. Running back Jesse Wilburn, a native of Memphis, guided the Tigers’ ground game on the season, while Robert Crawford led the passing attack. The star-studded 1956 squad featured a number of players who earned All-America honors during their time at TSU, including guard and captain James Buford (’56), tackle Charles Gavin (’56 & ’57), halfback Fay Mitchell (’56), end Leon Jamison (’57), end Charles Walker (’59) and tackle Fred Metcalf (’59). The Tigers rolled through the regular season, yielding just 31 points (3.4 points per game) in the first nine games. The stretch included shutout victories over Grambling State (33-0), Maryland State (6-0), Kentucky State (40-0) and Lincoln University (47-0). For their efforts, the Tigers were invited to the Orange Blossom Classic at the Orange Bowl in Miami, Florida, to take on Florida A&M to crown the 1956 Black College Champion. Playing in front of a crowd of more than 40,000, the Tigers found themselves in a back-and-forth game with the high-powered Rattlers. In the waning seconds of the game, the Tigers clung to a 41-39 lead as FAMU had the ball on the TSU one-yard line. Needing just a field goal to win, the Rattlers instead elected to send their offense on the field. After a delay of game penalty pushed FAMU back to the six-yard line, the TSU defense came up with three defensive stops to earn the 41-39 victory and win the Black College National Championship. The team, which gets together every 20 years to catch up, was also honored during the 1996 Homecoming football game. For all of the accomplishment for the 1956 football team, the squad was inducted into the school’s athletics hall of fame in 1996. 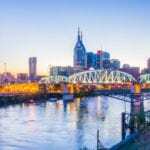 The 2016 Tigers defeated Arkansas-Pine Bluff 44-0 at the John Merritt Classic at Nissan Stadium in Nashville. Previous articleHolding Court with the ‘King’ – Larry King!